Now that Fuji’s lens lineup is really starting to get fleshed out, the company has turned its attention to accessories that extend the functionality of those lenses, literally. This is a thorough review of Fuji’s MCEX-11 and MCEX-16 Macro Extension Tubes. If you’d like to purchase these extension tubes, or anything else for that matter, please consider using one of the affiliate links below. The price is the same for you, but a small percentage of the purchase price goes to me, which really helps keep this site going. Thank you! For an detailed look at how these extension tubes impact maximum magnification and working distance, check out my MCEX-11 vs. MCEX-16 page. Where size is are concerned, the MCEX-16 is of course larger than the MCEX-11 by virtue of it extending the distance of the lens from the sensor by 5 extra millimetres. The MCEX-16 in particular will add enough length to a lens that it won’t fit into and already snug compartment in a camera bag. In terms of weight, again the MCEX-16 has a few grams on its short sibling, but the weight penalty of either tube is hardly worth considering. Not much. Beyond the tubes, there’s a little instruction/warrenty booklet, and that’s about it. I tweeted when I received them that a little pouch like the ones that come with the X100 coverters would have been nice. As it stands you may want to have an extra body and lens cap handy. Fortunately the tubes can be attached. The MCEX-11 and MCEX-16 extension tubes are both very well built. They attach to the lens so tightly that it’s easy to forget they’re there. I haven’t found there to be any play between the tubes and lenses. When mounting, align the orange dot on the tube with the orange mark on the lens and turn the lens clockwise until it clicks into place exactly the same way as it does directly onto the body. Then mount the tube to the lens mount following the same orange mark to dot alignment. The tubes themselves mount as solidly onto the camera as the lens would. This might seem obvious, but it’s reassuring to know Fuji haven’t cut corners on the mount. Dismounting the tube works the same way dismounting a lens does, however in order to remove the lens from the tube, a small lever needs to be pressed. This lever is perhaps a little bit small an fiddly, but it gets the job done. More often than not I end up removing the lens and the tube from the camera when I only intend to remove the lens. As annoyances go, that’s pretty minor and can be chalked up entirely to habit and user error. The extensions tubes include electronic contacts to pass autofocus and aperture information to the camera. Not much to say here. You can expect the same image quality you’re already getting from your XF lenses. The max magnification of some lenses will approach or even (just barely) exceed 1:1. There are a couple things to bear in mind, however. The first is when you get this close to things, your depth of field is reduced, resulting in smaller apertures being used. Diffraction could become an issue, or JPEG may be preferable so Fuji’s “Lens Modulation Optimizer” can work its magic. The second is distortion is greatly exaggerated as one gets closer to their subject. Take the image seen in this post. It was captured with the 60mm f/2.4 Macro and MCEX-16 extension tube. The extrusion of the “XF ZOOM” text is greatly exaggerated compared to how it appears to our eyes thanks to distortion. The MCEX-11 and MCEX-16 may seem expensive for what I’ve heard referred to as “essentially air,” but they are the most economical way to get started with close-up photography. Just $100 is all it costs to take a lens like the 18mm f/2 from a maximum magnification of 0.14, all the way to 1.01 via the MCEX-16. 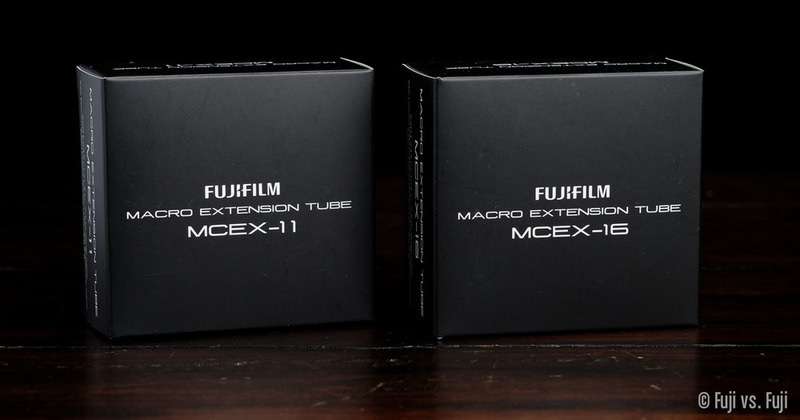 For visual reference of the affect these tubes have on your lens, check out my MCEX-11 vs. MCEX-16 piece here.